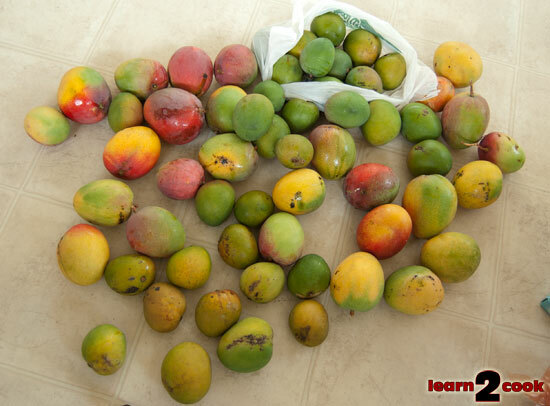 It’s been raining mangoes down here at the Pikko household, with this week bringing a particularly heavy set of fruit deciding it was time to plunge down to the ground without waiting for us. We gave away almost 20 manoges on Easter Sunday, but by the time Wednesday rolled around, we had over sixty that we had either picked or picked up from the ground and were partially salvageable. I’d wake up the morning after picking in the afternoon and find five more on the ground. So frustrating! As you can see, they range from perfectly ripe to brightly ripe to overripe. The overripe ones I’ve just cut up for puree and the same for the the fallen ones, since I’m going to be squishing them into pulp anyway. The haydens are sadly mostly bitten by fruit flies, so we didn’t want to give those away. The good ones Mr. Pikko took to the office. I gave more to Grandma J for mango bread yesterday too, but I still had to cut up around 18 yesterday and make… SORBET! 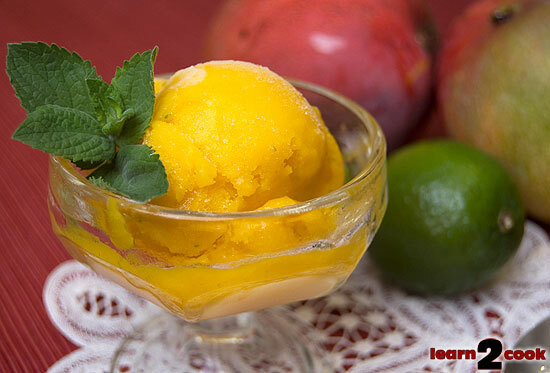 Yeah, I’d started freezing chunks of mango, but when that started to build up I looked for other things to use and found a really good and simple mango lime sorbet recipe. I chose this one out of the slew of recipes on Foodgawker because it didn’t have alcohol. Although I have a big Costco bottle of rum in the closet, I wanted to keep it out for the kids, no matter how small the amount. This recipe was simple, alcohol-free, and totally delicious. My only problem is, I keep running out of limes. I’ll have to buy some at Costco this weekend. I have five batches of this stuff in my freezer and two more batches sitting in the fridge waiting for a turn in the ice cream maker . You basically just puree mango, sugar, lime zest, lime juice, and a pinch of salt together and then put it into your ice cream maker. I’ve found myself just eyeballing it with the mango and then adding sugar and lime as needed to taste. I even did a batch of strawberry mango sorbet because I had too many strawberries, but will post about that another time as I haven’t had a chance to take a picture yet. The glass is this really old set of pudding cups that my Grandma Mu gave away that I claimed. <3 to her! This is going to be a great summer treat when the heat gets here! My First Loaf of Bread!